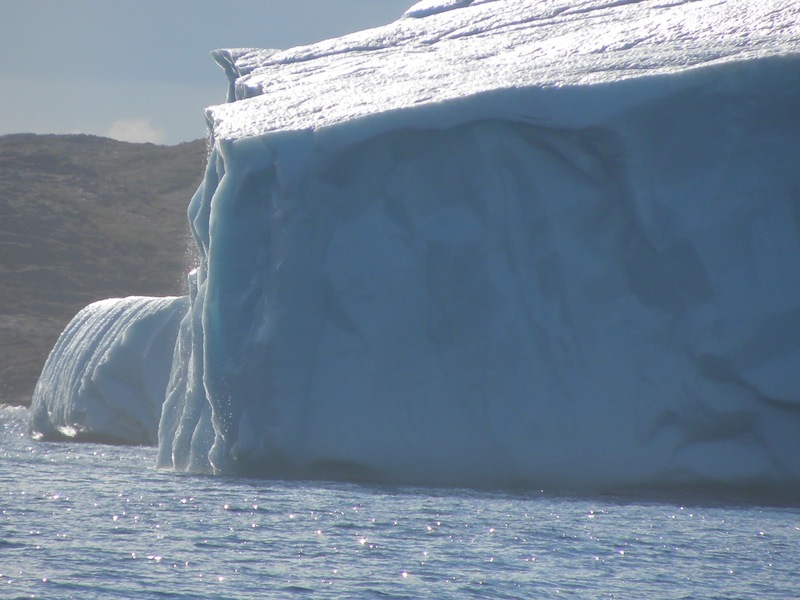 For the first time that we can remember we encountered ice inside the harbour - a ‘berg had grounded and broken up either side of the entrance channel. When we left, early the following morning, a large section had drifted across the channel to ground itself on the other side. Plenty of big ‘bergs outside, as there were last year. 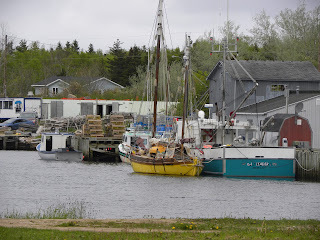 The day began bright and sunny, enough to lure us away from the dock, but rapidly went downhill with thick fog. The winds were still strong and though heavily reefed we were still moving quickly. Radar and eyes strained to detect stuff but nothing was”visible” although, having messed with the ground on the radar we were now only getting a 3 mile signal so stuff may well have been out there. As we found out when the sun made an appearance in the late afternoon. Huge ‘bergs seemed to be everywhere although the biggest surprise was the sight of another yacht heading in the same direction. Eventually Francis B hailed us, having recognised the boat, despite the sail colour change. They were bound for Fox Hbr, which we’d toyed with but thought the 3 day SW’s might be a great start. When the wind suddenly switched to the north then north east we gave up and motored to join them. On again the following day, Sat 25 June. Little wind but we hoped to get clear of as much ice as possible in daylight…. A number of mistakes were made! The log shows poor speeds, until we’d been out 50 plus hours and we didn’t cover much. We also heard a vhf conversation between two ships where one warned the other to stay east of a position as the ice to the west was very hard. The position was close enough, I felt, to our route for me to keep to the east of our rhumb line. In the end it worked against us as the wind veered from NW to N and we were now heading toward the Cape Farewell area. True it was some days away but as the hours went by and we rattled along at a good rate I became increasingly concerned. Long time readers may recall the beating we took around this area when we returned in 2005, a beating that has remained etched into my mind. In the end this is just an excuse of course as the decision was made to abandon trying to head through the PCS (much to Bee’s utter despair) and head south of east to give Farewell a wide berth. The winds treated us kindly to begin with but a day’s run of 29 nm was recorded. Still, although slow, we were making progress toward Reykjavik a little over 600 miles away. The stiff NW’s kept us moving, albeit a little south of the rhumb but all was good. 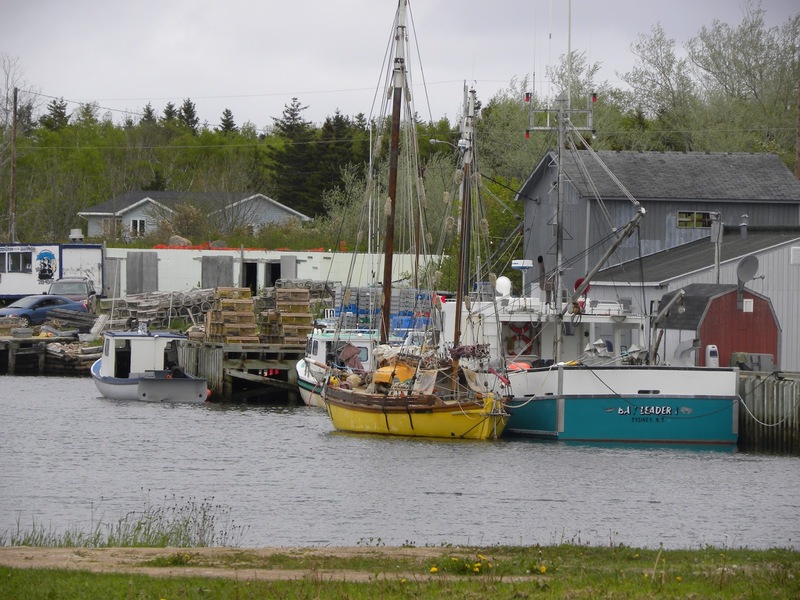 As ever, with us, we have trouble getting weather info…Bee had done a great job picking up stuff from Canada on the ssb but it was becoming less relevant as we had turned the southern tip and were out of their area. We had no success with Iceland or Greenland and I have never have been able to persuade weather fax to appear on the laptop. So we did what we always do, look at the barometer and read Alan Watts “Instant Weather Forecasting” However we did remember a snippet from the Canadians which indicated stiff easterlies(!!) coming on Tuesday. And they did. Initially we were able to make use of them and make some northing to get above 60N but as wind speeds hit between 30-40knots we surrendered and hove to, under reefed main for what we hoped would be a short time. As our course was taking us inextricably toward Scoresby Sound and the ever attendant ice we changed tack and drifted south. Not the worst sea conditions we’ve been in by a long way but the dreariness of the sky, a dull, dripping grey with poor visibility made worse by the patchy fog had a demoralising impact on us both. and our moods matched the bleak greyness. We remained hove to, checking the sky, childish hoping/imagining/wishing that we were seeing signs of improvement. And we did…blue sky sometimes briefly made itself known only to be snuffed out by the relentless grey ”wallpaper” we were covered by. We read up on what we could, deciding in the end that whatever it was had stalled and no change would be possible for some time. The wind, somewhere between E and NE favoured a southerly escape rather than a northerly one and so here we are; 3 days into a grey, sapping mire than shows little intention of easing. The winds remain resolutely out of the eastern quadrant, the direction we want to go of course, and whilst they eased from the 25-30+knots the seas remain lumpy. Our course wanders between SE and S, whereas our temporary destination lies firmly East. We’re hoping that we might soon, within the next 48 hours, pick up favourable westerlies and a little sunshine would be very welcome too. Aboard, life continues although we’re both pretty fed up about things, weather wise. At the height of the blow when winds were consistently between 35 and 40 knots, the bitter end of the outhaul on the traveler came free and wrapped itself around the bobstay. This is the line that enables us to drag the jib to the end of the bowsprit from the safety of the deck so without it life was going to get harder. As the seas were still running hard we delayed tackling the job until things looked safer. It meant lying on the foredeck, armed with a boat hook and laboriously trying to persuade the line to reverse its tangling. Easier said of course as the waves seemed to recognise a bit of sport a periodically leapt onto the deck burying parts of me in water. The last part we left for a calmer day as it would require one of sliding out on the bowsprit to untangle the mess. Bee wanted to do that bit and today we duly suited up, roped her into a harness, attaching same to the jib halyard and away she went. She had discovered how to make the vids with our camera and I clung with one hand to the halyard, I filmed with the other. It took her about a minute to sort it out and we were both glad we’d allowed the seas to moderate and we’d done the thing first thing this morning as the seas are running again. 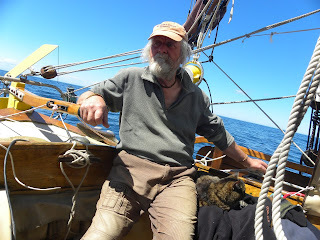 We continued heading SE for far too long, not that we had any choice in the matter as it wasn’t until 4am yesterday (Sunday) that the winds finally moved, reluctantly, into a westerly element. Finally we were able to make a more easterly course, albeit toward the SW tip of Ireland. With the change came a brightening of the weather, if not our mood, and blue pushed aside the awful grey that has dominated. Much, much worse than the last northerly crossing we did for sure. Toward the afternoon the winds backed a little more and we set a course for Barra in the Outer Hebrides, still a good 750nm away. When the winds eased yesterday we ran with more sail but reefed down again for the night. Hannah seems to run best with a quartering breeze under a double reefed main, stays’l and working jib, remaining, for the most part balanced allowing the steerer to cope. Speeds remain good, the last 5 days have all been above 100nm. As I write we’re bowling along at well over 6 knots…. The seas have been a frustrating combination. A long, loping swell usually out of the N or NE, battles with the normal wind-driven wave train meaning we sometimes get hit beam on by a great lumpy wave. Most are harmless but sometimes a larger version hits and we’re knocked over, lee deck under water and the sound of heavy spray and water tumbling across the windward deck.The swells are running at around 3m (10’) so are a real nuisance and we run at a less than optimum course in order to retain some comfort aboard but it remains a life at an angle. I’ve spoken of the “Air Only Vents” before but they really are a wonderful piece of engineering. 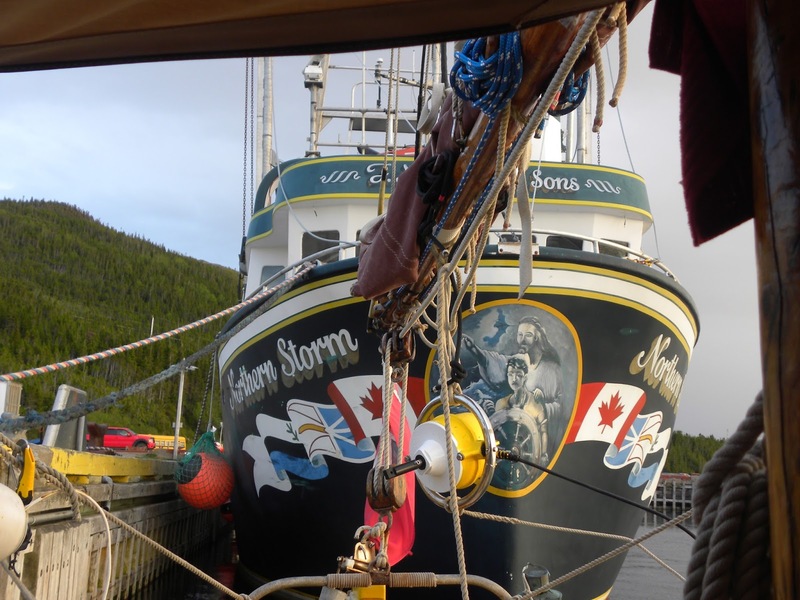 Despite the lee rail being under, or when the bowsprit gets buried, either way we can get a torrent of water coursing across the deck in search of mischief, the vent lives up to it’s name. No matter what the conditions outside we’ve always been getting air in whereas when we fitted dories we’d remove the cowls and shut them off. If you still want to keep your dorades these little gems will fit inside giving you the best of both worlds. If you’re looking for a solution to ventilation try looking up this company. Sat 16 July Under 200nm to Castlebay, Barra. 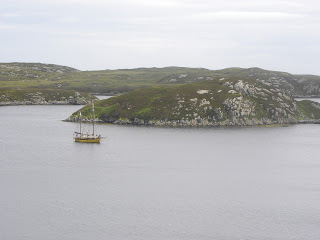 The journey ended with a whimper as we ran out of wind about 20 miles from Barra and the ebbing tide wanted us closer to the shore than we wanted so we motored to an anchorage. Thick fog accompanied us of course and the radar resolutely refused to produce a signal. We’d already opted to go for Vatersay rather than Castlebay as it would be less crowded. We crept in slowly although it’s a wide enough bay free or almost so of much danger. We checked we were where the chart was saying we were by testing actual depths against the chart, picking up the 10 metre contour and slowly made our way in. Dimly through the murk could be seen the shapes of boats and beyond the glow of lights from a small village. About 2am the anchor dropped into 10 metres, we dug ourselves in, went below lit the fire and poured a stiff drink and luxuriated in the notable lack of motion. Toots climbed onto the table, stretched out in front of the fire and went to sleep.